Where to Eat It: Studio Catering Co. In the hot summer months at Walt Disney World people often look for something cool and refreshing. At Disney’s Hollywood Studios dining options are somewhat limited and has some of the worst food of the four parks. 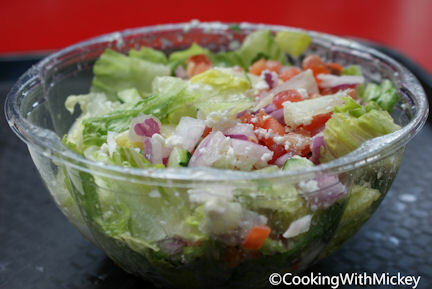 One of the locations to grab a salad is the Studios Catering Co., as they offer a Greek salad. In search of a cold meal I tried this salad. This salad is a terrible option. The lettuce was soggy, the red onions were faded and not crunchy, and the tomatoes were mushy, like they are when you cut them the day before and then refrigerate them. Sadly, the best part of the salad was the feta cheese and the kalamata olives that were strange in color, very faded. This was a counter service meal that I wish I had skipped and had a beer instead. So if you are looking to find a bite of food at Disney’s Hollywood Studios that isn’t hot, I don’t recommend the Greek Salad at Studios Catering Co. Instead, maybe head to Starring Rolls for a cold sandwich. Labels: Disney food, Disney World, Disney's Hollywood Studios, Greek salad, Quick Eats, Studio Catering Co.